...Photographic Ramblings...: Lines = Designs ~ Exploration Thursday! 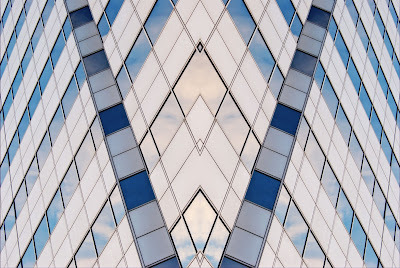 This is the last reflective, sky bound, architectural shot for a little while anyway. Tomorrow I'm diving into what I'm learning about flash photography and apparently this has hit a nerve with many of you. I've gotten tweets and emails from many of you who have mentioned you'll be tuning in because of always having been confused or intimidated by flash... just keep in mind, I'm still figuring it out myself and have a long way to go, but I'll enjoy sharing the things that are beginning to make sense. In the meantime, I love playing with mirrored effects in PSPx3 when it comes to architecture. You can focus purely on elements of design. I love that the patterns are made of walls of glass reflecting the sky. It's simple, but my screen comes to life with the pattern. Off I go to decide which area of flash to even start with tomorrow... our jumping off point. And it would seem others have used a flash theme this week too... if you'd like to check out some tips from the master of flash himself, Rick Sammon, you can find his blog feed listed along the right side of my blog in the group of blogs I read or you can simply click here. See you all tomorrow! Thanks for the ramble!